At Jade Communications Inc., we have been the go-to firm for structured cabling systems in Florida since 1987. We pride ourselves on our ability to conduct site examinations that thoroughly and accurately determine pre-installation needs. Our team of staff and engineers are also well renowned nationwide due to our keeping abreast of the latest in technology relating to data, voice, video networks and more. 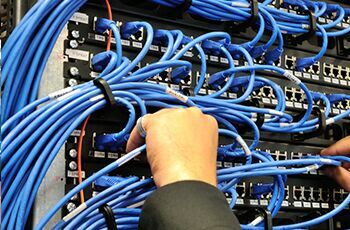 Our eagerness and willingness to stay in the vanguard of such innovations allow installations and upgrades of structured cabling systems for our clients to retain a much longer shelf life than many of our competitors that are still recommending and implementing old and outdated tech. Fixed cost service contracts with guaranteed response times. Well thought out and customized maintenance contracts designed to maximize productivity, minimize future costs and extend the shelf life of the structured cabling systems. One year warranty on defects related to materials and workmanship. Network integrity warranties of up to 25 years. Nationwide servicing through our network of qualified structured cabling installers. The need for pre-installation site examinations and quality implementation of structured cabling systems and networks continues to be an area of concern in South Florida where the transient nature of some vendors and cost cutting while sacrificing quality is prevalent. Be sure to reach out to us! We are an industry leader in this area of business in South Florida for a reason. We are headquartered in Boca Raton and diligently serve the structured cabling needs of our clients throughout Florida. At Jade, it is our goal to exceed our customer's expectations with our technical skills, quality products, and world-class customer service. Contact us today at (561) 997-8552 to find out more.